When you write about awesome companies every day, you can get pretty jaded. 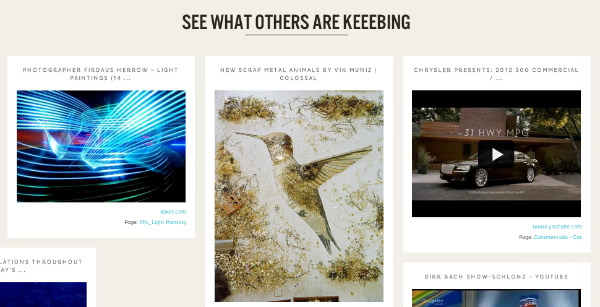 All of the great ideas start to blend together in your mind until it becomes kind of hard to get excited, so I was pleased and surprised by just how much I love this new social sharing site, Keeeb. Signing up for Keeeb felt like I was playing a game, in the best possible way. I was excited to see what was going to happen next, which is extremely rare for a signup process. In fact, I can say pretty confidently that I don’t think that’s ever happened to me before. Then, once I started keeebing, I couldn’t stop! I found myself thinking of more and more categories that I’d like to fill and people I’d love to share them with. This is the perfect way to get lost in the rabbit hole that is the internet, mainly because it makes me feel like I’m doing something other than just surfing. I’m creating something! Want more specifics on the site that’s poised to steal Pinterest’s thunder? Keep reading for my exclusive interview with founder Konrad Gulla. What inspired you to start Keeeb? Actually I got the idea for Keeeb in November 2009. I’ve been working on it for quite awhile. Full of new ideas and inspiration I thought that discovering, storing and working with online content was not really working. I wanted to change that; I wanted to do something better. That inspired me to do Keeeb. I wanted to create something that would help people work better with information. Everyone is talking about information overload. You know, like 50 or more tabs open; emails, links, all that kind of stuff. What do I do with the interesting things? The things on a webpage that are really good, like this one image or video or paragraph? How do I collect all of that good stuff? That’s why I wanted to create Keeeb. Where’d you get the name Keeeb? I was looking for something that says what we’re doing. You keep the stuff, you know? I also obviously needed a name that still had a free .com domain. It comes from “save, organize, and share” and the three “e’s” that you have at the end of these words. Okay, interesting. I didn’t think about the fact that it sounds like “keep,” but that totally makes sense. People are always talking about the debate over whether or not you should name your company related to what you do. I think that’s a good combo because it’s related but it’s not immediately obvious. If you guys wanted to pivot, you could. Like Google has become a verb. Yeah, exactly, like Google. And it does work. When our users write about Keeeb they always say stuff like, “Yeah, I love Keeeb. I love keeebing stuff.” So it works! Where are most of your customers based right now? Most of them are still in Germany but we have people from India, from Thailand, people that are keeebing stuff from Dubai. We also have people from the United States. I feel like there are quite a few apps out there right now that grab info and images off of websites. What differentiates Keeeb from those? There are a couple of really good ones popping up right now, which really just shows us that there’s a need for this. Essentially there are different groups of apps, doing different parts of what Keeeb does all together. For example, for normal social bookmarking you have Digg and Delicious. They’re great if you like lists. Then you have services like Scoop.it or Snip.it, which was acquired by Yahoo in February. They are essentially the same as a bookmark but with an image and the meta-description. But you can’t keep only the essential bits and pieces. Really it’s a bookmark with an image and you’re still stuck with the meta-description and you can’t really save just the essential. Apps like Pocket that let you save the links for reading them later are really nice and pretty but in my opinion, they just shift the real problem to another place. Instead of 50+ open tabs you have a pile of pages to read later. And maybe you will read it later or maybe not. But when you come back to your good reads a month later you will not know what was important and what was not. You need to reread everything again. With Keeeb you’re able to scan or read an article, keep the things that are essential, and group them together. This is what’s differentiates us from the other apps. It’s because of how easy it is to group and work with the content from different sources. Then of course you have Pinterest, which is great and they have an impressive community but it’s just good for images. It’s interesting you bring up Pinterest because it definitely popped to mind when I was looking at Keeeb, especially when it comes to the design. The words that popped to my mind were “online scrapbook.” Was that an intentional move on your part? No. If I showed you my original mockups from 2010, you’d still think that looks like Pinterest. Pinterest was just the lucky one that was the first to get big. Now when anyone sees something that has those tiles they think, well, it looks like Pinterest. It probably will always be like that but if you’re working with bits and pieces of information, essentially that’s the only thing you can do. I like it. I think it’s a good design and I’m really picky about designs. Thanks! You got lucky because you didn’t see our first one. It wasn’t bad… But I like our current design. It was really important to us to change it. We did that just in January and I’m pretty happy with it. I think we have a good basis to work on. Who’s we? It’s you and…? We’re seven guys right now. 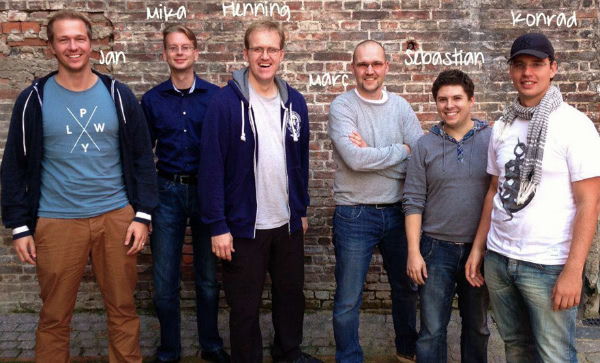 Four developers, a marketing chief, a design student who’s working with us, and then it’s me. My background is communications design. I did a lot of programming in Flash back in the day when Flash was cool. The past few years I’ve been building up an interactive unit at Markenfilm, which is Europe’s largest commercial film company. Yeah, I studied communications design. I started working in advertisement in ’98 but I’ve always been drawing stuff. My first Photoshop version was version 4 and that was in ’98. How did you meet your team? How do you guys know each other? The first three of us are me, Henning- the technical officer – and Jan, who’s the frontend developer and who is responsible for everything you actually see when you are keeebing. I’ve known Henning for over ten years; our families are friends. He had previous been working at canonical (The Ubuntu Company). When I asked him, if he knew somebody who was able to create something like Keeeb with me, he quit his job. I was really lucky. Jan and I also have a history. We had been doing web development together. When I had Jan and Henning on board I knew that it actually could work out. Technically Keeeb is quite hard to do. And we did everything from scratch. Is Keeeb a fulltime thing for you guys or do you have other jobs as well? No. For everyone else it has been fulltime and right now I’m switching. I’d been working two jobs – at Martin Film and at Keeeb a the same time, which was pretty tough for the past couple weeks. Now we just closed a financial round so I’m switching to Keeeb 100%. No. It’s exciting. I’ve learned so many things through Keeeb; so many ups and downs. No matter if we’re really successful or not, I’ve already learned so many things so it’s the best thing I could do. When I was looking at Keeeb it seemed like you guys have a pretty wide idea of what it would be used for. Is that intentional or did you guys consider focusing on one area? We have users from many different areas. Photographers, financial advisors, bankers, bloggers, designers, marketeers… So yes, you can do a lot with Keeeb, but this comes as a blessing and a curse. As a startup you need to concentrate and this is what we are now doing. That’s why I’m asking. It’s an interesting model. Yeah, so right now we’re concentrating a lot more than we did before. We’re concentrating on web professionals, the people who are creating the web. It’s like marketeers, social media experts, programmers, designers, bloggers. Yeah, you! We get really good feedback from this crowd so that’s who we’re concentrating on. As I said before, we’re actually planning to have three major thing with Keeebs and that fits perfectly with this group. Is that something you want to share or is that still under wraps? Well, I can’t say too much right now but I can say that at the moment Keeeb is about collecting, restructuring, and sharing information. The next step will be about you and your information; things that you have collected. We’ll definitely do something for you that will be really cool. The last step will be a new approach to content discovery. Do you have any advice for other startup founders? That’s the toughest question because I don’t want to be a smartass or something. Be a smartass if you want to be a smartass! I’m a total smartass. Never give up. Believe in your idea and don’t be afraid to constantly change. I mean, you shouldn’t change your basic idea. You should stick to that I guess. But your business model and the things you said you won’t do or you will do: these are things that are probably going to change a couple times. One of my great examples of this is Facebook. They are constantly changing and even though people hate it sometimes, I think that’s one of the main reasons they’re still around and why they’ll be with us for a long time. They’re changing. They adapt. Great advice, Konrad! Thank so much for taking the time to talk to me, but I have to go. There is some very important keeebing to be done!